All are welcome! First Parish Church is Open and Affirming, welcoming all to participate fully in the life of our church family, its ministries, fellowship, leadership, rites and sacraments, regardless of ability, race, ethnicity, social or economic situation, sexual orientation or gender identity. Bell Sunday---bring a bell to ring! Child care is available in the nursery during the service. A tour of our church: FPC is a happening place! You should be in our loop! 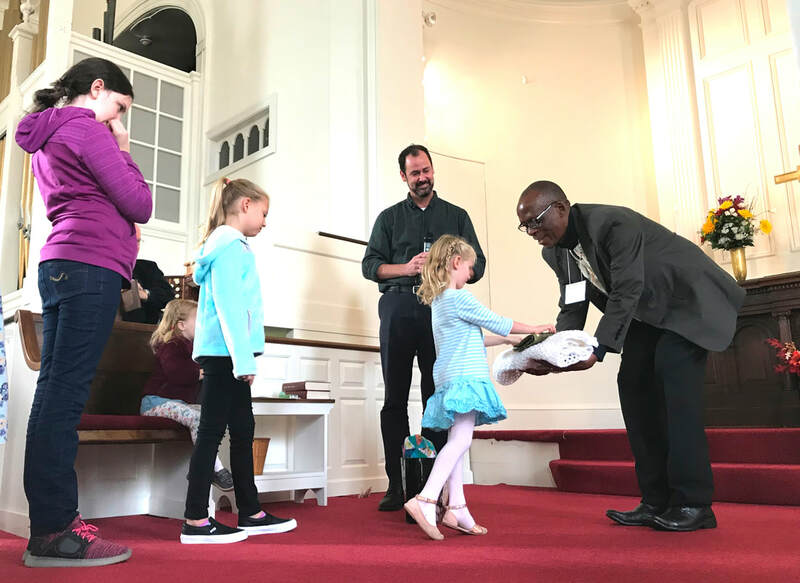 Find out what's going on at First Parish Church with STEEPLE CHAT, our weekly email Church newsletter. We'll keep you up to date! Our Sunday School program begins each week with FIRST Kids Gathering time at 9:30 a.m. in Nazareth Hall for children, their families, and anyone else who would like to attend. At 9:55 a.m., all move upstairs to the sanctuary for worship. Following the Children's Message during the service, kids and teachers return downstairs for their classes and activities. For the exciting details of our Sunday School program, please click here: Sunday School. Our current Director of Faith Programming will be leaving the position at the end of this school year. Applications are now open for this position which will begin July 1, 2019. Details on this position are here: Director of Faith Programming. ​First Parish is a Stephen Ministry Church that provides weekly individual and confidential spiritual care for those in need. Please contact one of the following to get connected: Judy Edwards, 603-978-4789 or Dave Dickson, 603-781-9791.